The hospital-grade plug diameter conforms to NEMA WD-6 and UL 817 standards; (1) the blades must be solid instead of folded brass, (2) the blades are usually nickel-plated, and (3) the plug includes an internal cable retention device or strain relief to prevent any stress to the plug’s internal connections. 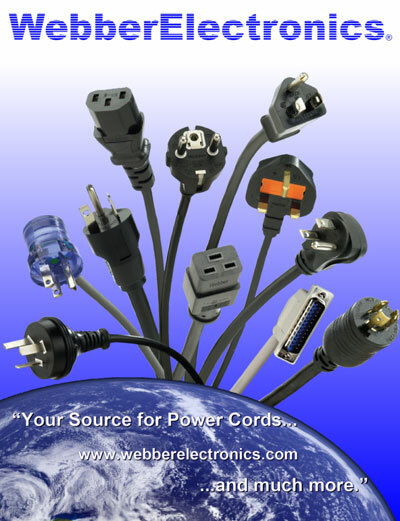 Webber Electronics Hospital Grade cords carry the “green dot” signifying that they have been designed and tested to UL 817 and CAN/CSA C22.2 no 21 as hospital-grade power cords and cordsets. Specifically, UL 60601-1 sections 57.2 and 57.3 require that “patient care equipment” used in the “patient vicinity” must use hospital-grade attachment plugs. “Patient care equipment” and “patient vicinity” are defined in UL 60601-1 sections 2.12.19 & 2.12.20. There are no specific maximum lengths for cords noted in the standards listed above, yet the equipment must pass the leakage current test requirements in UL 60601-1 and CAN/CSA C22.2 no 21. cord length has an effect on leakage current within a system. It is imperative that the ground connection be reliably maintained to protect the patient and medical staff. Although many hospitals prefer that the plug be clear so that internal connections can be inspected visually, the UL and CSA standards do not mandate clear plugs, nor do they provide any restrictions on color. Gray is another common color for hospital-grade plugs and cords.